Three weeks ago Marc’s parents came to visit us here in Costa Rica. Months ago when we started to plan for their visit, Marc and I of course thought…”Let’s take them to the beach!” But the more we lived here in the mountains of the Central Valley, the more we realized Marc’s parents would have more fun staying around here. The Central Valley of Costa Rica is filled with mountains, volcanoes, and coffee fields. To me, this is where the beauty of Costa Rica lies. And it’s a lot cooler up here in the mountains, which is a big plus! Marc’s parents (a.k.a. Nana and Papa) stayed for seven days, but we fit a lot in. The first full day here, we all went to the El Toledo coffee farm and took a tour. El Toledo is an organic coffee farm in the mountains of Atenas (the town we used to live in). Actually it’s more than an organic farm, it’s a permaculture farm. I had never heard of perma farming, so I found it fascinating. To learn more about permaculture farming, click HERE. Gabriel, our tour guide helps his dad run the farm, which has been in the family for generations. Gabriel is a wealth of knowledge and he speaks fluent English, which was a big bonus for us Gringos! Here are some photos from the coffee tour. Here are some photos from the Basílica Nuestra Señora de los Ángeles. When we were at the church, most of the Costa Ricans upon entering, knelt down and walked to the altar on their knees. Maria observed the others and followed suit. It was one of those moments that melts your heart. There was a fountain of holy water underneath the church that also has healing powers. Notice Camden chugging the holy water! We also drove up and up and up into the clouds to visit the Irazu Volcano. The altitude was so high that we were above the clouds and we all could feel shortness of breath. 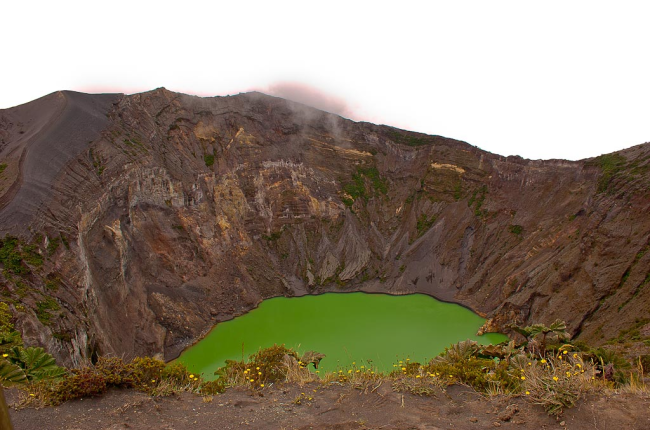 The Irazu Volcano is famous for it’s emerald green 980 feet deep lake in the crater. I remember visiting Irazu back in 1998 and I vividly remember it’s bright green lake in the middle. This is what it looked like (photo courtesy of costarica.com). So when we all got to the crater you can imagine I was baffled that there was no green lake. I kept thinking we were missing something or that we hadn’t found the volcano yet, especially since the brochure we picked up at the entrance shows the big green lake. When we left, we asked the park ranger at the entrance what happened. It turns out that the lake disappeared in 2010, when a neighboring volcano became active and the Irazu volcano developed a crack as a result and all the water flowed out. Good to know I hadn’t lost my mind. Here are photos of the lakeless volcano, still beautiful none the less. I love the photos of Camden and Maria running on the ash. It looked like we were on the moon. One day we made a trip to the La Paz Waterfall Gardens, about an hour away from our house. It is a beautiful location with four waterfalls and birds and animals. Here are some photos. The waterfalls were gorgeous but my photos don’t do it justice. La Paz is a little slice of heaven. Marc’s parents also came with us twice to the orphanage. I don’t know why I didn’t bring my camera. Shouldn’t leave home without it. So I unfortunately don’t have any photos from that. But Marc’s parents worked hard moving furniture and power washing the back bodega building. They also treated Cherie and her kids to an evening at the movie theatre and McDonalds. What kid doesn’t like the movies and McDonalds? It was quite the hit. Here are some other photos from their visit. Nana and Papa, thanks for coming to visit. But they couldn’t get rid of us because two days after they left Costa Rica, we flew back to the US for my grandmother’s memorial service. I’m working on a blog post on our trip back for the memorial service and I hope to get it out tomorrow or Saturday. Jen,once again you have treated us to a wonderful travelogue. Thanks so much. Awwwww….. To see Maria go to her knees and honor the patron saint must have been so beautiful, sweet girl! What a blessing to have Marc’s parents with you! I absolutely LOVE all the pictures at the waterfall, everyone with wild life clinging to them! What a hoot! Thank you for sharing a sliver of your adventure with us, it always brings me Joy!